We've seen ads for Aree's Dawg House in the Georgia Straight. On their ads, they say that their hotdogs are made without preservatives and nitrites. They might have won Georgia Straight's best hot dog award for the year. And/or the Vancouver Courier's award. The Golden Plate Awards from the Straight just came out this Thursday (March 20) and there's the ad! I'm quite proud that I can work the scanner. On an afternoon with no other lunch possibilities, we decided to try their hotdogs. I am not swayed much by the Georgia Straight award; I am more intrigued by the promise of hotdogs made without preservatives and nitrites. It's been a while since I've had a hotdog. The dogs are divided into two general categories: smokies and hot dogs. I chose a kosher, 100% beef smokie, which was advertised as lower fat than the other smokies. I did not even get to see what other kinds of hotdogs Aree had, because, for some reason, I fixated on the top two choices. I had a footlong smokie with some caramelized onions. My usual condiments for hot dogs are ketchup, mustard, and sweet pickle relish. Sometimes, I would put raw onions or hot banana peppers. I usually don't deviate from the first triumvirate above though, especially if I'm trying a hotdog for the first time. Which is why I cannot explain the brain cramp that made me put sauerkraut on my smokie! I didn't like the sauerkraut at all and I couldn't really appreciate the hotdog I ordered in its full glory. The kosher smokie did taste very clean and low-fat (none of the luscious mouthfeel and greasiness of a full-fat hotdog). I liked the hotdog and would order it again. The real star of Aree's Dawg House is the bread. Aree mentioned a few times that their buns are homemade and they are indeed different from the commercial hotdog buns you get from the supermarkets or other hotdog stands. Aree's buns do not have the soft, pillowy, Wonderbread white sandwich bread texture: they were lighter, similar to a Vietnamese baguette banh mi bun. The crust was a light, crispy crust, not thick like a French baguette. Aree's buns are perfect for their dogs and I start to wonder why all hotdogs don't come between bread like Aree's. After much deliberation, I ordered the Kosher 100% beef hotdog as well. I was really tempted by all the other smokies, but JS finally convinced me to go with the "plainest" hotdog. I liked the hotdog too, but I think I would like the other "fancier" types. So I would definitely go back and sample those other ones. I put spicy corn relish and roasted garlic mayo on mine. It was good! Sometimes quick grab-n-go food like this really hits the spot. I must agree about the bun. That bun is the clincher. 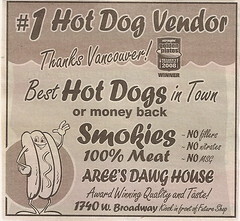 I would definitely return to Aree's and sample more of their hotdogs. Overall, an 7 out of 10. The smokie was $5.99 + tax. Aree is also one of those hard-working types, so besides having those great buns (hotdog buns, that is), I'm all for supporting someone who obviously works hard. I kind of want another hotdog right now.